With the 20-year nostalgia cycle making ’90s properties hot again, the Mighty Morphin Power Rangers is currently experiencing its second coming in pop culture with new comics and a major motion picture slated for March 24, 2017. The Power Rangers franchise never really went away thanks to a steady stream of TV shows offering slightly modified versions of the central concept—teenagers with attitude that gain superpowers and giant machines to help them fight the forces of evil—but this new wave of Power Rangers projects goes back to where the franchise began in the U.S., reviving the characters more easily recognized by adults who grew up in the ’90s. The main Mighty Morphin Power Rangers title from Boom! Studios is an adequate comic-book interpretation of the original TV series, but it’s very beholden to source material that wasn’t all that good to start. The miniseries MMPR: Pink has much more freedom to play around and tell new stories because it takes place later in the MMPR timeline, after Kimberly Hart, Trini Kwan, and Zack Taylor have left the team to pursue new paths. All three of these former Rangers play a part in Brenden Fletcher and Kelly Thompson’s story, but Kimberly is at the heart of the book, turning to her old friends when she discovers that the citizens of St. Moineau, France, have been turned into mindless green monsters. MMPR: Pink began by establishing Kimberly as an action hero without her superpowers, and that first issue was an impressive debut that presented Kimberly’s personality, her relationship with her mother, and her formidable fighting skills while immersing readers in a seaside European environment. Being the Pink Ranger sharpened Kimberly’s hand-to-hand fighting and made her proficient with a bow and arrow, but it’s her lifelong training as a gymnast that makes her especially fun to watch in battle, and this comic does things with Kimberly’s acrobatics that were never attempted on TV. She’s an extremely swift and graceful combatant, but there’s also immense power behind her movement, even before she gets a superhero upgrade from Zordon. That upgrade comes with a redesigned costume, with artist Daniele Di Nicuolo giving Kimberly a uniform that is deeply rooted in the classic Power Ranger look but that appears much more grown-up. The old Pink Ranger skirt is eliminated in favor of an outfit that shares more in common with a riding suit, especially with the black accents on top that evoke the look of a leather motorcycle jacket. Those accents also establish Kimberly as the leader of a new group of Power Rangers that she creates by sharing Zordon’s power; with the exception of the Black Ranger, none of those other costumes have any pools of black, and they all share pink highlights that assert Kimberly’s dominance over the group. Kimberly’s the guiding force here, but this series has been largely about her embracing teamwork and putting faith in the people around her. This theme first develops when she teams up with a St. Moineau citizen, Serge, looking for his missing family, and when Kimberly’s in over her head and unable to reach the main team of Power Rangers, she reunites with fellow retirees Trini and Zack, who are always eager for a new opportunity to help others. 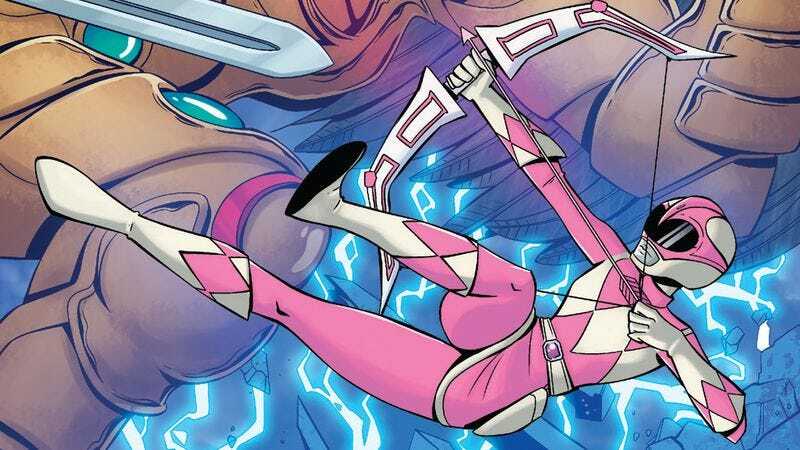 Last month’s issue reinforced Kimberly’s bond with her mother, who fights against her newly mutated nature to help her daughter, and this week’s MMPR: Pink #4 forces Kimberly to work with her enemy, Goldar, if they’re going to make it out of their current situation alive. Goldar thinks Kimberly is pathetic for allowing herself to partner with an opponent, but she refuses to let this flying dog-man distract her from her primary goal of survival. She’s confident in her abilities and her mission to do good, even if it means saving someone bad, and that personal drive is a big reason why Kimberly is such an endearing lead. This creative team makes being a good person look cool, and Kimberly’s spirit empowers the people around her by literally giving them superhuman abilities. The last couple years have been great for superhero titles starring female leads, and MMPR: Pink’s writers have been major forces in that movement with Fletcher’s work on Batgirl, Black Canary, and Gotham Academy and Thompson’s work on A-Force, Captain Marvel & The Carol Corps, and Jem & The Holograms (which isn’t quite a superhero comic, but has superhero elements). Tini Howard joined the book as script writer with last month’s issue #3, and the transition was seamless. Kimberly’s voice stayed consistent along with the pacing of the story, and the book actually got better after bringing in a new creative voice. There’s a particularly clever sequence in this week’s issue involving the Power Rangers building up the town’s defenses: The first pages establish where each Power Ranger is and their specific duty, and when Kimberly calls her teammates to get into formation, there’s a five-panel row showing head shots of each Ranger listening to her call. Directly underneath that is another five-panel row, showing glimpses of each Ranger’s location with off-screen dialogue from the Ranger that previously inhabited that space, which is a concise way of indicating rapid movement without requiring the artist to draw all those characters in action. Daniele Di Nicuolo is a relative newcomer to comics, but he’s made a huge impression with this series thanks to his slick linework, expressive characters, and dynamic action sequences. His work on the first issue was full of energy and detail, and he’s refining his craft with each new issue to make the visuals even cleaner and bolder. Sarah Stern has a similarly short list of previous projects, but her vibrant coloring on both MMPR: Pink and Boom! Studios’ Goldie Vance have made her a name to watch. She makes strong choices in her palettes, but shows restraint in her rendering so as not to distract from Di Nicuolo’s precise linework. The MMPR comics are trying to attract adult readers with a nostalgic appreciation for the concept and characters, but this is still a property aimed at children. The creative team of MMPR: Pink is very aware of this, and the story is simple enough that younger readers can easily follow and engage with it, but deep enough to grab and hold the attention of older readers. I’m one of those adults that loved the original series (I wrote about it for this Memory Wipe feature five years ago), but revisiting the show has only yielded disappointment. That’s not the case with MMPR: Pink, which has successfully translated the thrill of watching Power Rangers as a kid into a comic that can be enjoyed by all ages.